The Board of Directors at 3M Company (MMM) announced a 35% increase in the dividend last week which is amazing for a company that already boasts a $92B market cap. I last looked at 3M almost a year ago, January 2013, and felt it was a bit overvalued at the time. Based on this year's results, I sure was wrong. 3M closed trading on Friday, December 20th at $136.72 giving a current yield of 2.50%. 3M Company operates as a diversified technology company worldwide. The companys Industrial and Transportation segment offers tapes; coated and non-woven abrasives; adhesives; specialty materials; filtration, energy control, and acoustic systems products; closure systems for personal hygiene products; and components and products used in automotive, marine, aircraft, and specialty vehicles. Its Health Care segment provides medical and surgical supplies; skin health and infection prevention, dental and orthodontic, and food safety products; inhalation and transdermal drug delivery systems; and health information systems. The companys Consumer and Office segment offers office supply, stationery, construction and home improvement, home care, protective material, consumer retail personal safety, and consumer health care products. Its Safety, Security, and Protection Services segment provides personal protection and safety and security products, cleaning and protection products for commercial establishments, roofing granules for asphalt shingles, infrastructure protection products used in the oil and gas pipeline markets, and track and trace solutions. The companys Display and Graphics segment provides optical film solutions for LCD electronic displays; reflective sheeting for transportation safety; commercial graphics sheeting and systems; architectural surface and lighting solutions; mobile interactive solutions; and electronic toll collection and parking management hardware and software. Its Electro and Communications segment offers electronic and interconnect solutions, micro interconnect systems, high-performance fluids, high-temperature and display tapes, telecommunications and electrical products, and touch screens and monitors. 3M Company sells its products through wholesalers, retailers, jobbers, distributors, and dealers. The company, formerly known as Minnesota Mining and Manufacturing Company, was founded in 1902 and is based in St. Paul, Minnesota. Analysts expect 3M to grow earnings 10.91% per year for the next five years and I've assumed they can grow at 2/3 of that, or 7.27%, for the next 3 years and continue to grow at 4.00% per year thereafter. Running these numbers through a three stage DCF analysis with a 10% discount rate yields a fair value price of $156.05. This means the shares are trading at a 12.4% discount to the discounted cash flow analysis. The Graham Number valuation method was conceived of by Benjamin Graham, the father of value investing, and calculates the maximum price one should pay for a company given the earnings and book value. 3M Company has earned $6.51 per share in the last twelve months and has a current book value per share of $26.43. The Graham Number is calculated to be $62.22, suggesting that MMM is overvalued by 119.7%. 3M Company's average high dividend yield for the past 5 years is 3.26% and for the past 10 years is 2.90%. This gives target prices of $105.00 and $118.06 respectively based on the current annual dividend of $3.42. I don't think you'll see a return to 3.00%+ yields as the yield was elevated during the recession skewing the normal operations numbers. So I'll use the 10 year average in my fair value calculation. 3M Company is trading at an 15.8% premium to this price. 3M's average low PE ratio for the past 5 years was 12.4 and for the past 10 years was 13.9. This corresponds to a price per share of $82.99 and $93.34 respectively based off the analyst estimate of $6.72 per share for fiscal year 2013. Both PE ratios are relatively close so I'll use the average of the two for my target entry price. Since the fiscal year is just about over and we're investing for the future, I'll use the the 2014 earnings estimate in my fair value calculation. The target prices are now $91.87 and $103.37 respectively. Since both low PE ratios are relatively close, I'll use the average of the two in my fair value calculation. This corresponds to a target price of $97.62 with a 13.1 P/E ratio. 3M Company is trading at a 40.0% premium, suggesting that it's overvalued. 3M's average low PS ratio for the past 5 years is 1.79 and for the past 10 years is 2.05. This corresponds to a price per share of $85.11 and $97.35 respectively based off the analyst estimate for revenue growth from FY 2013 to FY 2014. The price targets don't include effects due to potential share buybacks, rather it's just based off the analyst estimate for revenue and growth, to be a bit conservative. Currently, their current PS ratio is 2.99 on a trailing twelve months basis. Once again I'll use the average of the two ratios in my target entry price calculation, giving a target price of $91.23. 3M Company is currently trading for a 49.9% premium to this price. The Gordon Growth Model is a quick way to calculate the fair value of a company using the current dividend, the expected dividend growth rate, and your required rate of return or discount rate. Assuming a constant 7.25% dividend growth rate and a discount rate of 10.00%, the GGM valuation method yields a fair price of $124.36. 3M Company is currently trading at a 9.9% premium to this price, suggesting that it's overvalued. For the DDM, I assumed that 3M will be able to grow dividends for the next 5 years at the lowest of the 1, 3, 5 or 10 year growth rates or 15%. In this case that would be 9.04%. After that I assumed they can continue to raise dividends for 3 years at 75% of 9.04%, or 6.78%, and in perpetuity at 6.00%. The dividend growth rates are based off fiscal year payouts and don't necessarily correspond to quarter over quarter increases. To calculate the value I used a discount rate of 10%. Based on the DDM, 3M Company is worth $88.49, meaning it's overvalued by 54.5%. 3M's trailing PE is 21.40 and it's forward PE is 18.53. 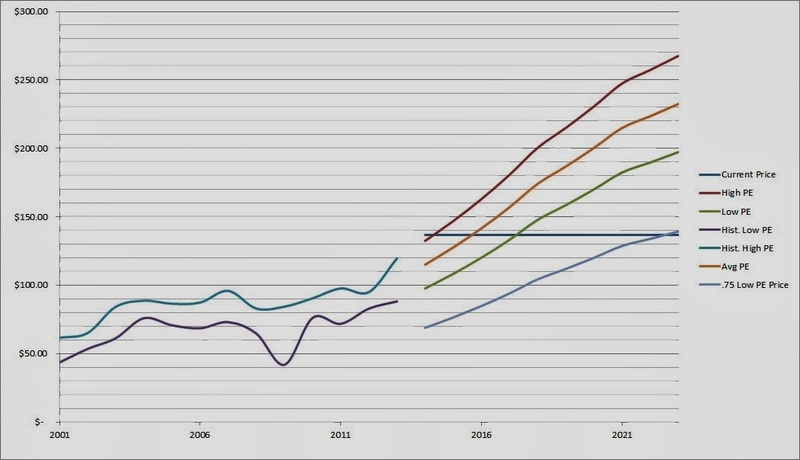 The PE3 based on the average earnings for the last 3 years is 21.59. I like to see the PE3 be less than 15 which MMM is currently well over. Industry comparisons are very difficult for 3M as they have their hands in so many different businesses. 3M's 5 year forward PEG ratio is currently 1.87. 3M's gross margin for FY 2011 and FY 2012 were 47.0% and 47.6% respectively. 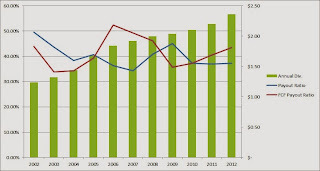 They have averaged a 50.9% gross profit margin over the last 10 years. Their net income margin for the same years were 14.7% and 15.1%. 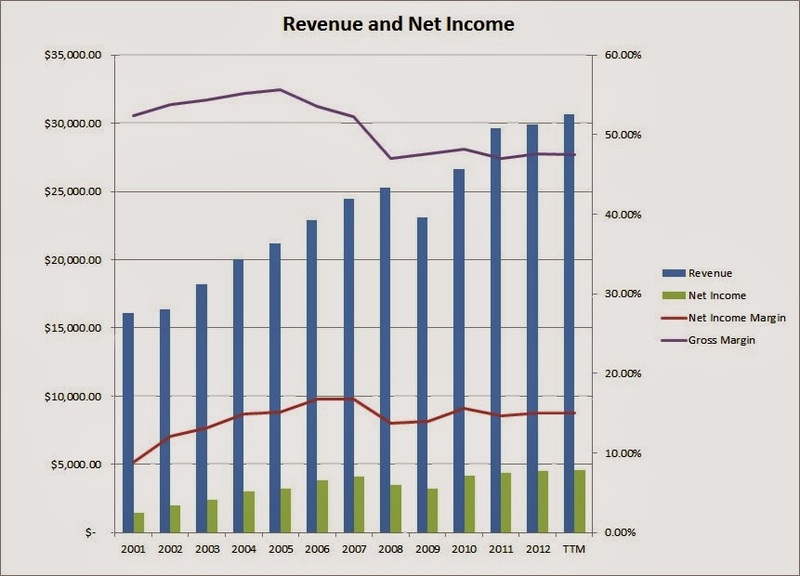 Since 2003 their net income margin has averaged 15.0%. I typically like to see gross margins greater than 60% and at least higher than 40% with net income margins being 10% and at least 7%. 3M is comfortably above the 40% threshold for gross margins and is killing it in the net income margin. Since each industry is different and allows for different margins, I feel it's prudent to compare 3M to its industry. For FY 2012, MMM captured 102.8% of the gross margin for the industry and 101.3% of the net income margin. 3M is doing a good job capturing higher margins than the rest of their competitors. 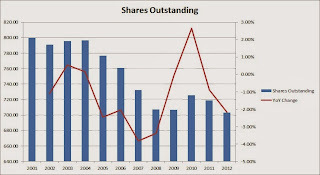 3M has done a pretty good job at decreasing the share count, although they have had 3 years of increases since FY 2001. 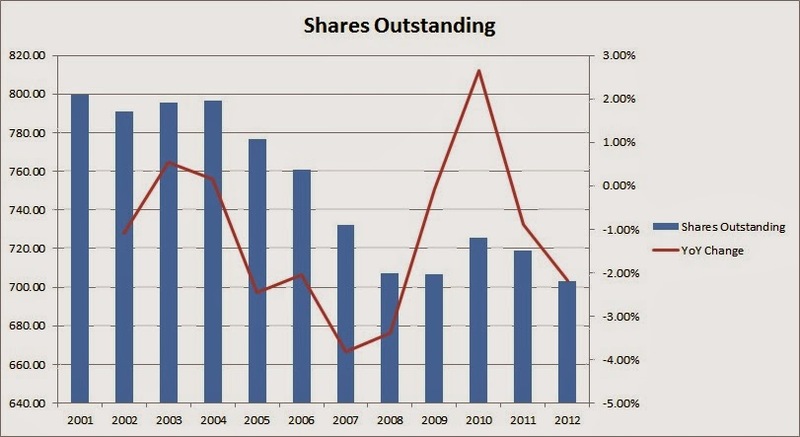 Over the last 10 years they've decreased the share count by 11.1% for an average annual decrease of 1.2%. Good news for shareholders though is that in the announcement of the dividend increase, management also announced an increase in the share buyback program. Their original targets were for $7.5B to $15B in buyback between 2013 and 2017, but have since raised that to $17B to $22B. The midpoint of the new guidance would suggest around 21% of the current market cap to be bought back. It'll be interesting to see how management executes the buyback strategy in order to get the best value for shareholders. If the share price is overvalued at the time of the purchases, that can lead to less efficient uses of the shareholders' capital. With the recent increase,3M is on track for its 56th consecutive year of dividend increases, firmly planting it with dividend champion status. They have increased the dividend at a 34.6%, 15.8%, 10.9%, and 9.0% rates over the last 1, 3, 5, and 10 year periods respectively. 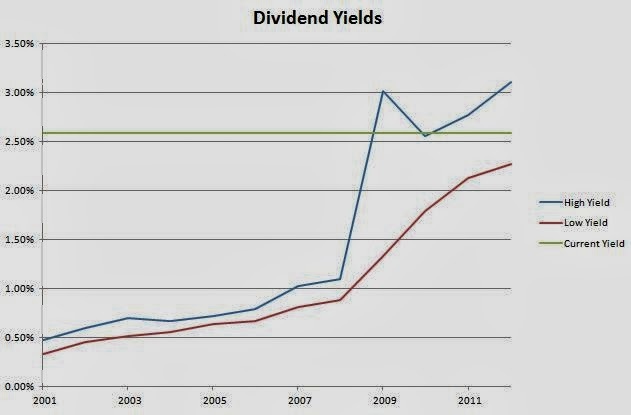 Dividend increases are based off fiscal year payouts and don't necessarily correspond to annual payouts. Obviously those 30%+ dividend increases won't be able to continue, but a growth in the neighborhood of 10-15% is very much possible if the EPS growth rate comes to light. 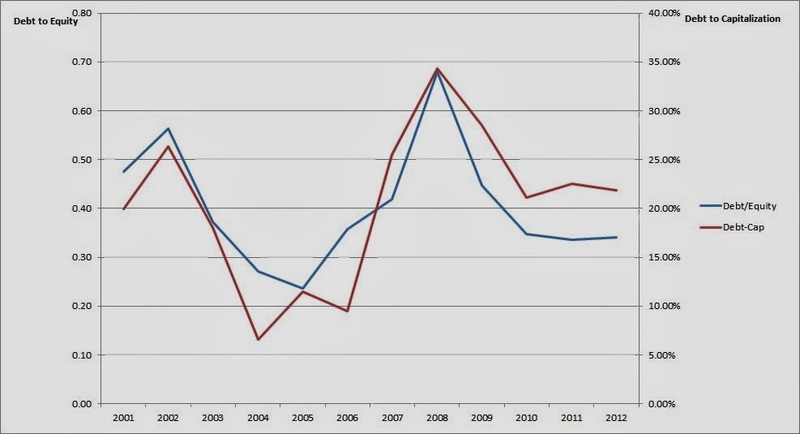 Their payout ratio based off EPS has averaged 39% over the last 10 years and been very consistent with a high of 45% in 2003 and a low of 34% in 2007. 3M's cash flow has consistently increased across the board. Over the last 5 years they've been able to turn approximately 75% of their operating cash flow into free cash flow and 45% of their operating cash flow into free cash flow after paying the dividend. 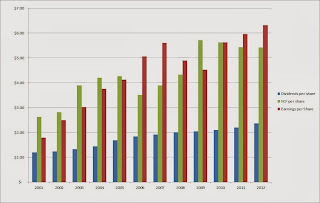 Their free cash flow has increased from $2.23 B in 2002 to $3.82 B in 2012 for an average annual increase of 5.5%. Their free cash flow after dividends has increased as well from $1.26 B to $2.18 B over the same time for an average annual increase of 5.6%. The free cash flow payout ratio has averaged 40.7% over the last 10 years and has been fairly steady in that time ranging from 34% to 50%. 3M's ROE has averaged a solid 30.5% over the last 10 years while their ROCI has averaged 24.5%. Their ROE has been fairly consistent too ranging from a high of 38.7% to a low of 25.4%. ROCI has ranged from 18.2% to 35.0%. The trend for both ROE and ROCI has been slightly negative over the last 10 years, but that's too be expected when you've been getting 30%+ ROE's and 25%+ ROCI's, there's only so many projects that can be found to increase the returns from those lofty levels. 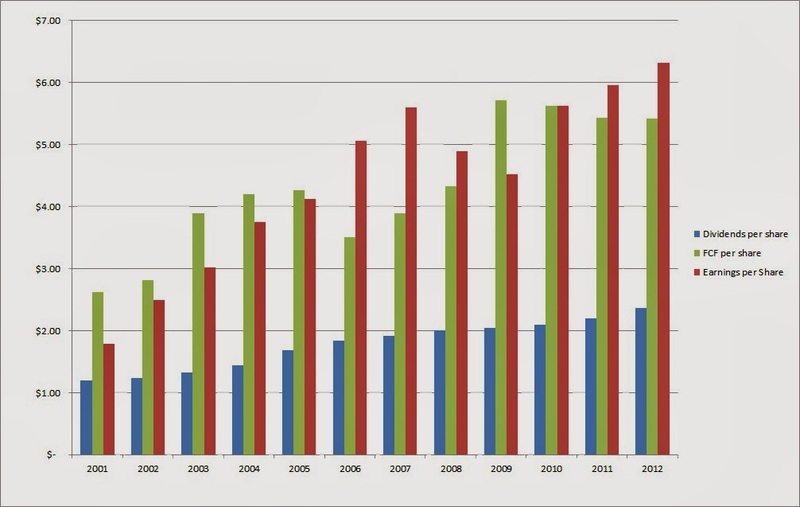 Despite an overall increase in total debt, their debt-to-equity ratio has remained very consistent starting with a 0.37 ratio in 2003 and ending at 0.34 in 2012. 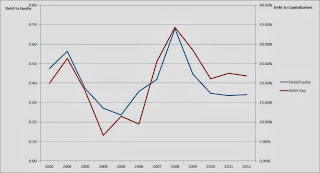 Debt-to-capitalization ratios have been fairly stable as well being 18% in 2003 and 22% in 2012. Management has done a good job maintain adequate debt levels and not letting the debt get out of hand. Since the basis of dividend growth is revenue and net income growth, we'll now look at how 3M has done on that front. 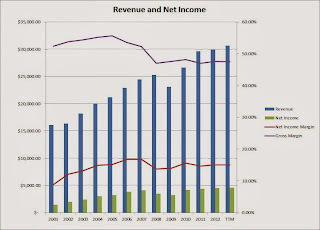 Their revenue growth since the end of FY 2002 has been excellent with a 6.2% annual increase growing their revenue from $16.33 B to $29.90 B in FY 2012. Their net income growth has outpaced revenue growth with a 8.6% annual growth rate increasing net income from $1.97 B to $4.51 B. 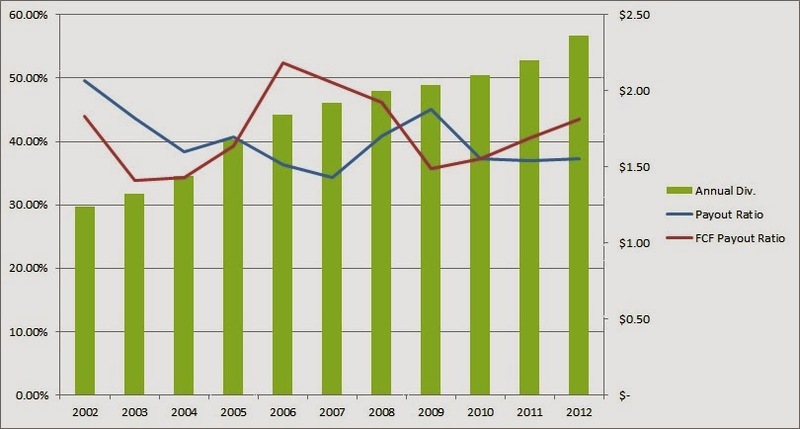 This has led to the net profit margin increasing from 12.1% in FY 2002 all the way up to 15.1% in FY 2012. The chart shows the historical high and low prices since 2001 and the forecast based on the average PE ratios and the expected EPS values. I have also included a forecast based off a PE ratio that is only 75% of the average low PE ratio. I like to the look to buy at the 75% Low PE price or lower to provide for a larger margin of safety, although this price doesn't usually come around very often. In the case of 3M, the target low PE is 13.1 and the 0.75 * PE is 9.8. This corresponds to an entry price of $97.62 based off the expected earnings for FY 2014 of $7.44, with a 75% target price of $68.90. Currently 3M Company is trading at a $67.82 premium to the 75% low PE target price and a $39.10 premium to the low PE price. If you look at the chart you'll notice that the current price line intersects the average forward PE line between 2017 and 2018. This means that assuming the growth pans out the way I've forecast and that the typical PE ranges are maintained going forward you're paying for approximately 3.5 years of growth at current price levels. The average of all the valuation models gives a target entry price of $105.43 which means that 3M Company is currently trading at a 29.7% premium to the target entry price. I've also calculated it with the highest and lowest valuation methods thrown out. In this case, the DCF and Graham Number valuations are removed and the new average is $103.95. 3M is trading at a 31.5% premium to this price as well. Assuming that 3M can grow their earnings and dividends at the rates that I assumed, you're looking at decent returns over the next 10 years at current prices. In 2023, EPS would be $14.45 and slapping an average PE of 15.46 gives a price of $223.44. Over the next 10 years you'd also receive $54.40 per share in dividends for a total return of 103.22% which is good for a 7.35% annualized rate if you purchase at the current price. If you purchase at the target entry price of $105.43, your projected 10 year total return jumps to 163.53% for an annualized return of 10.2%. According to Yahoo! Finance the 1 year target estimate is at $134.52 suggesting it's fairly valued at Friday's closing price. Followers at The Motley Fool have MMM rated as a 5 out of 5 stock, meaning they're bullish on the company. However, Morningstar has them rated as a 2 star stock suggesting that it's trading above their fair value estimate. 3M Company is a huge conglomerate with their hands in a diverse set of industries. They have industrial products, office supplies, health care, safety and security, displays and graphics, communications departments and many more. Despite being an industrial related company, the breadth and scope of their various businesses allows them to have fairly consistent growth. As one sector of the economy slows down, another one is usually picking up steam, which is exactly what allows 3M to consistently deliver growth in the company, earnings, and most importantly their dividend. 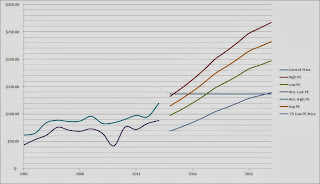 The dividend growth does come in spurts however as the growth from 2004 through 2006 was 9.09%, 16.7%, and 9.52% followed by 4.35%, 4.17%, and 2.00% over the next 3 years. Personally I'll wait on the price to get into a better value range, although I said that last year and the year before that as well. This reminds me of the Warren Buffett quote about it "being better to buy a great company at a fair price, than a fair company at a great price." In the long run the rich tend to get richer and 3M is one of the best run companies you can find. The yield is at a decent level here at 2.50% and it's a decent place to start a position, but for now I'll have to wait as I have other uses for my capital planned. What do you think about 3M Company as a DG investment? How do you think the long-term dividend growth prospects are? I'd argue the case that you were not wrong in saying it was overvalued. Price action does not prove or disprove something is undervalued or overvalued. Price action merely reflect what someone is willing to pay. Look at AMZN or CMG. People are willing to buy an overvalued asset right now for the hope of increased growth in the future. The best we can do is line up the odds in our favor of selecting a quality investment that we think will give us a return (cap gains or dividends). I sold MMM back in 2012. Even with hindsight I do not regret the action. I had a plan and a strategy that has worked for me and I stuck with it. IMO, its not about the one that got away vs all the failed investments I have avoided.